Thanks to Marie Kondo, bookshelves have taken on a whole new meaning for home decor. 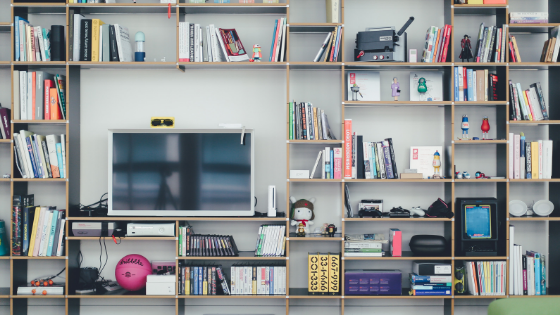 Here are a few options when it comes to arranging your shelves! Regardless of title, author or subject, sort your books by color. If you have enough to do a real ROYGBIV rainbow, then go for it. Otherwise, sort the colors you do have and add to the shelves in groups. This creates a pleasing display — but it may take you longer to find what you want. You can also incorporate other decorative items that match the colors to make a complete, cohesive look. Libraries arrange books by author and subject. You don't have to break out the Dewey Decimal system, but arranging your books this way makes things easy to find. In many cases, it also creates a look that is cohesive and more unified. Your group of Deadpool comics will just look better when they're displayed together, and the colors will all work well, too. Add that Wade Wilson Funko pop in front and you have a collection, not just a random pile. Your books will take the back seat to other, more important items. With this approach, you will incorporate the precious pieces you may otherwise have tucked away. A piece of art you made and love, a treasured gift from a friend, framed ticket stubs from an important event, and more can be displayed alongside your books to create a personalized look you'll enjoy. This allows you to showcase not only your favorite reading material but to see the items, photos and important pieces you would otherwise have tucked away, creating a look that is uniquely yours. Whether you are a lifelong bookworm or have other items to incorporate, you'll love the spacious layout of our Sandy Springs apartments and be able to find room to skillfully display your entire library. Stop by and see the difference in one of our spacious, comfortable homes!